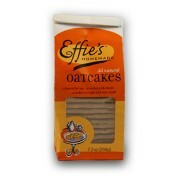 Effie’s Oatcakes are a 4th generation family recipe with origins in Cape Breton, Nova Scotia. Crisp, lightly sweetened, with a nutty flavor, oatcakes are a perfect snack any time of day. 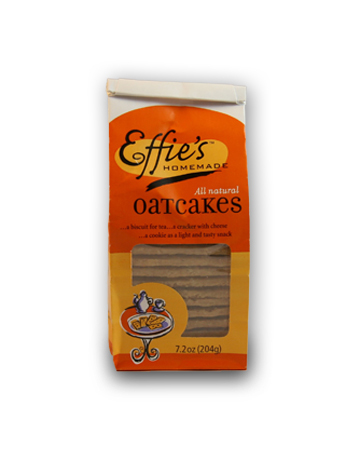 Effie's Oatcakes are great by themselves, but they're also wonderful when paired with other specialty foods. Some of our favorites are tea, sharp cheddar or Stilton cheese, chocolate, and jams. NUTRITIONAL INFO: Serving Size Approx. 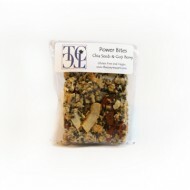 2 pieces (34g), Servings per container: 6, Amount Per Serving: Calories 170, Calories from Fat 80, Total Fat 9g (14% DV), Saturated Fat 5g (25% DV), Trans Fat 0g, Cholesterol 20mg (7% DV), Sodium 135mg (6% DV), Total Carbohydrate 22g (7% DV), Dietary Fiber 1g (4% DV), Sugars 6g, Protein3g, Vitamin A (4% DV), Vitamin C (0% DV), Calcium (0% DV), Iron (2% DV). Percent Daily Values (DV) are based on a 2,000 calorie diet. Made in a facility that also processes eggs, milk, peanuts, soy and tree nuts.